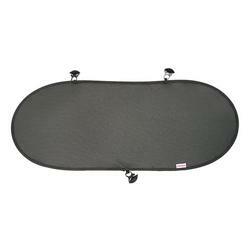 Protect your rear facing baby from rear window sun and glare. The pop open design always holds its shape for a smooth, wrinkle free look and a secure installation. The solar mesh helps block sun and glare while maintaining driver visibility. Attaches in seconds and sized to fit all cars, mini-vans and SUV’s.